Fix your portions, fix your life! Do a little Internet research on weight loss and you’ll probably find yourself neck-deep in a sea of unfamiliar words and phrases like “macros,” “amino acids,” “weight-loss plateaus,” “metabolism,” and “BMI,” and on and on. What Is the 21 Day Fix Eating Plan? 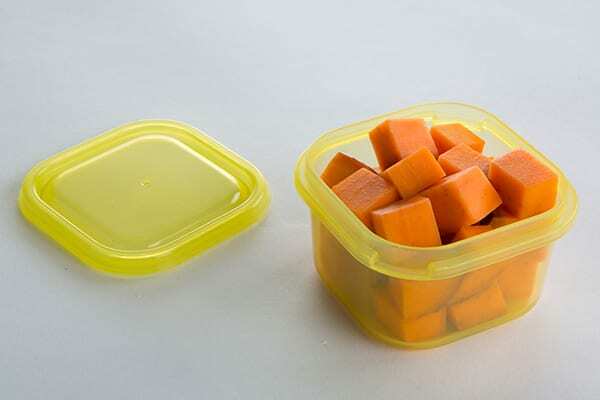 It’s a portion-control eating plan, so no elaborate calculations or weighing — that’s what the containers are for: Each color-coded container corresponds to a type of food (more details on the containers below). If it fits in the container and it’s on the approved food list, then boom, you’re done. You’re not going to feel deprived or hungry because each meal is roughly 40 percent carbohydrates, 30 percent protein, and 30 percent fat — a balanced combination that won’t leave you craving junk food or empty calories. 1. Calculate your caloric target. There’s a simple formula in the guide; all you have to do is plug in some numbers. 2. Find the calorie plan that corresponds to your caloric target. Each plan tells you how many of each container you can have per day. For example, if you’re on Plan A (1,200-1, 400 calorie range), you can have three green containers, two purples, four reds, two yellows, one blue, one orange, and two tablespoons of oils and nut butters a day. 3. Start shopping and cooking. And each plan is flexible — you don’t have to hit an exact number of calories; you just have to stay within your plan’s caloric range. If you don’t know where to start, check out the FIXATE cookbook and watch Autumn and her brother Bobby prepare FIX-approved meals on their new cooking show. You can also find meal prep guides for every calorie plan on the Beachbody blog. Bonus: All the meal preps and recipes include container equivalents, so all you have to do is check them off your list. 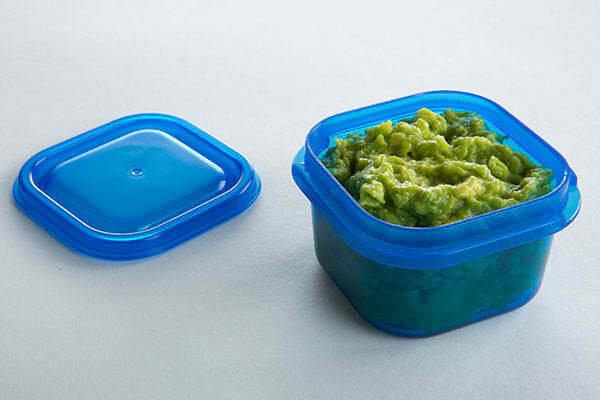 You only count containers — it’s a lot easier to keep track of three green containers than calculating the number of calories in everything you eat. 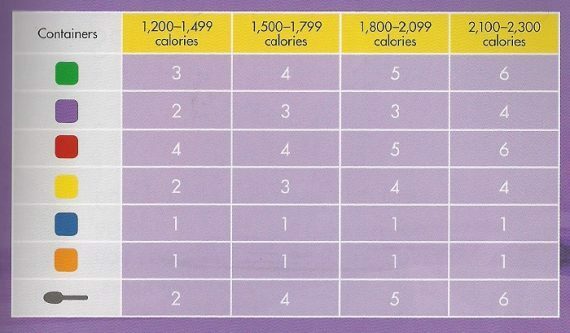 The only time you have to do any kind of math is when you figure out which calorie category you fall into. That’s it. When you first see the containers, you might be thinking, “What? That’s not enough food!” But once you start the program, you may actually find yourself feeling full before you’ve finished all your containers for the day. That’s because healthy food has more volume — and is more filling — than junk food. If you can’t finish all your containers for the day, just eat what you can. Just make sure you’re eating a little from all the containers instead of filling up on what you like and avoiding what you don’t like. 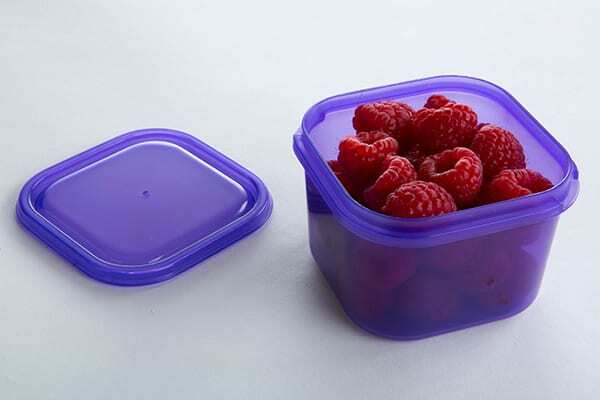 The guide provides recommendations on how much of one type of food can fit into a container, but you can mix and match foods in the same category. So if you don’t want to eat a whole green container of spinach, fill it with whatever combo you want, like half spinach and half carrots. That still counts as one green container. 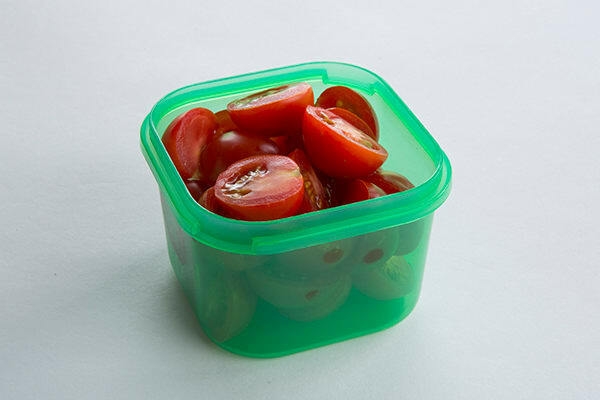 And as convenient and transportable as the containers are, you don’t have to eat out of them. You can simply measure out portions in the containers, then put your portions on a plate or in a bowl. 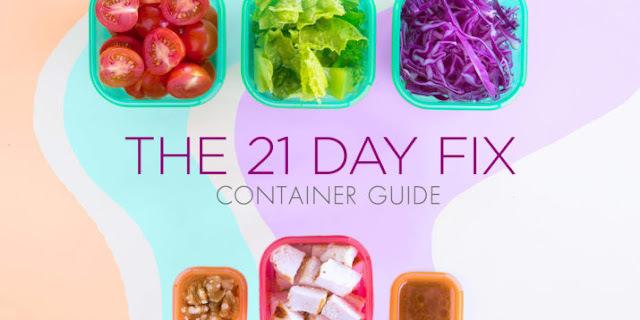 Now that you know how and why 21 Day Fix works, let’s get down to the nitty gritty: What foods go into each container. The guide includes lists of “approved” foods that are arranged according to nutritional value — the higher the food is on the list, the more nutritious it is. The first rule of Fix containers is: As long as the lid fits, it counts. Now that doesn’t mean you can squash an entire chicken breast into a red container, but don’t feel like you have to be polite about leaving room — pack it in. Below, we’ve listed just a few examples of the foods that go into each container; check out the guide to see all the foods you can eat. Your veggies can be cooked, raw, sliced, or chopped. It can be all one veggie or a mix of different kinds. Berries, grapes, and cherries are the perfect size to pop into your purple container, but you’ll want to cut larger fruits like watermelon, or fruits with pits, like peaches, into smaller chunks. Don’t limit yourself to animal proteins like chicken or red meat. 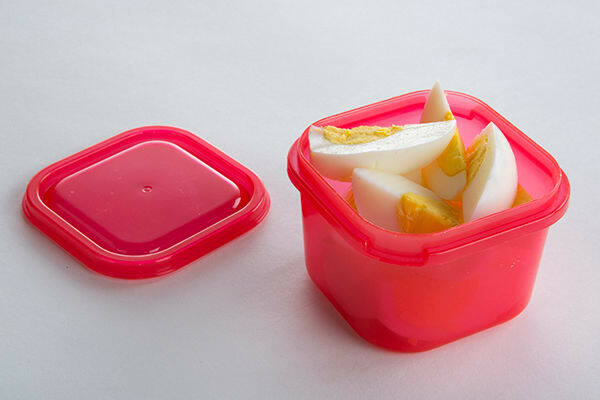 You can fill your red container with any kind of protein, like yogurt, whole eggs, tofu, cottage cheese, tempeh, or protein powder. These are foods like rice, beans, sweet potatoes, and whole-grain pasta. For foods that don’t fit into the container, the guide provides equivalents. For example, if you love a morning whole-grain English muffin, then half a muffin is the equivalent of one yellow container. Hello, nuts, cheese, and avocado! You can also put in foods like hummus and coconut milk. But before you go, well, nuts with your nuts, the guide provides specific amounts: 12 whole raw almonds, 14 peanuts, eight cashews, etc. — so don’t try to pour a whole bag of nuts in there! 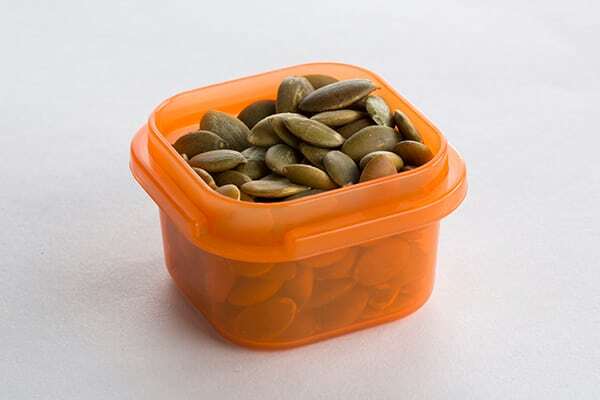 This wee container is for calorie-dense foods like seeds, flaxseed, and 21 Day Fix-approved dressings. The guide includes recipes for dressings like Dijon vinaigrette, lemon-tarragon vinaigrette, and creamy herb dressing, so no bland salads for you. There’s also a teaspoon measurement for oils and butters, such as olive oil and peanut butter. A teaspoon isn’t provided with the containers, so you can just use your own. Can I Drink Coffee or Tea on 21 Day Fix? Unlimited: You can drink all the coffee and tea you want, as long as you only use these FIX-approved add-ins: cinnamon, lemon, pumpkin spice, and nutmeg. One or Two 8-Ounce Cups: If you like a little a little milk and sweetness with your caffeine, you can have one or two eight-ounce cups with these FIX-approved add-ins: one or two tablespoons of low or nonfat milk and one or two tablespoons of raw sugar, honey, molasses, maple syrup, agave syrup, or stevia. Can I Still Eat Chips, Cookies, and Drink Alcohol? Yes! But… (sound familiar? )… here’s the rule: you’re allowed three indulgences per week. Just some of the treats you can eat: kettle chips, tortilla chips, banana-oatmeal cookies, dried fruit, and chocolate. (Hallelujah!) If you prefer to drink your treats, you can sub in a beverage instead, like wine, beer, 100% real fruit juices, and kombucha. And once a day, you’re allowed a Shakeology base such as milk, almond milk, or coconut water, allowing you to jazz up your daily dose of dense nutrition! You can also “hack” your containers with modifications: Instead of using a yellow container for a treat, use a purple and a blue to mix walnuts, green apple, and cinnamon. It’ll taste like a apple pie, without all the unhealthy added sugar. “You’re not following it to a T,” Autumn says. “Because if I wanted you to have one less carb, I would have given you one less carb.” The 21 Day Fix nutrition planned is designed to be followed exactly as it’s written to obtain optimal results. If you fall into a category that calls for three yellows per day, you are meant to eat them all. And who doesn’t love carbs? It’s a win-win for everyone. Watch Autumn answer more 21 Day Fix questions below. Want more info on the 21 Day Fix, Portion Fix containers, or curious about my Fit Clubs? Complete the form below and I'll reply within 24 hours! Can't wait to hear from you.